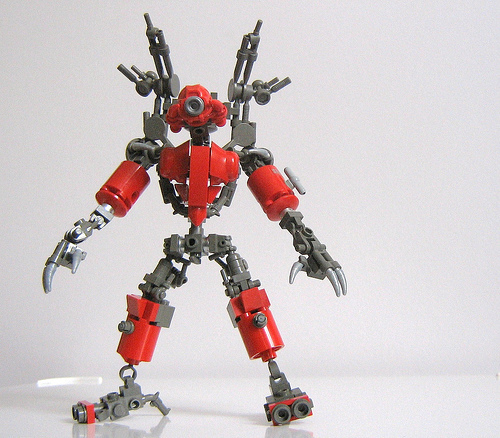 Can you spot all of the rare parts in this mecha by Peter Reid? What do those Red Darth helmet come in? Does anyone know? Are those R2 bodies rare in red? And maybe those paddles in dark grey? No, smcginnis , dark gray Signal Paddles are not rare and nor are the red R2d2 bodies there is so many of those red bodies I will not list their quantities. I don’t mean rare as in ‘how expensive are they;’ I mean it as in ‘how many sets were they in.’ According to both Peeron and BrickLink, dark grey paddles didn’t appear in any sets. Now, they probably might’ve, at one point, but I don’t know where. I do remember now seeing the R2 bodies in some fire helicopters, though. Where did he get those red Vader helmets? Are they custom painted?